The global market for agricultural disinfectants was valued at USD 1.64 Billion in 2015 and is projected to grow at a CAGR of 4.3% from 2016, to reach USD 2.11 Billion by 2021. The main objectives of the report are to define, segment, and project the size of the global agricultural disinfectants market with respect to type, application area, end use, form, and region, provide detailed information regarding the key factors influencing the growth of the market, and strategically profile key players and comprehensively analyze their core competencies. This research study involves the extensive usage of secondary sources such as Food and Agriculture Organization of the United Nations (FAO), FEFANA (EU Association of Specialty Feed Ingredients and their Mixtures), International Food and Agribusiness Management Association (IFAMA), and others to identify and collect information useful for this technical, market-oriented, and commercial study of the agricultural disinfectants market. The primary sources are mainly several industry experts from core and related industries and preferred suppliers, manufacturers, distributors, service providers, reimbursement providers, technology developers, alliances, and standard and certification organizations related to all the segments of this industry’s value chain. In-depth interviews have been conducted with various primary respondents, including key industry participants, subject matter experts (SMEs), C-level executives of key market players, and industry consultants among other experts to obtain and verify critical qualitative and quantitative information as well as to assess future prospects. The value chain of agricultural disinfectants begins with R&D and product development, in which the selection of source and the quality of the product are determined by the requirement of the product. The value chain helps in bringing about coordination among stakeholders such as The Chemours Company (U.S.), Zoetis (U.S.), Nufarm Limited (U.S.), The Dow Chemical Company (U.S.), and Neogen Corporation (U.S.) for smooth business operations. The market size of agricultural disinfectants is projected to reach USD 2.11 Billion by 2021, growing at a CAGR of around 4.3% from 2016. The global agricultural disinfectants market has grown exponentially in the last few years. Increase in demand for animal products, emergence of greenhouse vegetable production and vertical farming, rising incidences of disease outbreaks among livestock, and ban on antibiotics in animal feed are the major driving factors for this market. On the basis of type, the agricultural disinfectants market is segmented into hypochlorites & halogens, quaternary ammonium compounds & phenols, oxidizing agents & aldehydes, and others (alcohols and acids). The quaternary ammonium compounds & phenols segment accounted for the largest market share in 2015, followed by oxidizing agents & aldehydes. The quaternary ammonium compounds & phenols segment is projected to grow at the highest CAGR during the forecast period. 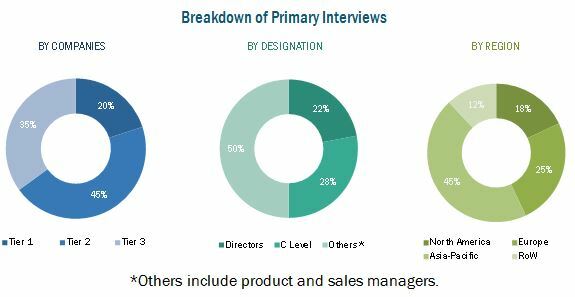 The agricultural disinfectants market, based on application area, is segmented into surface, aerial, and water sanitizing. 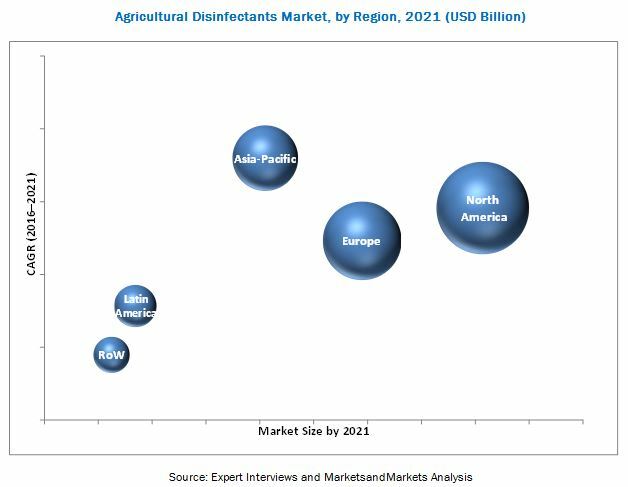 The surface segment accounted for the largest share in the global agricultural disinfectant market in 2015. It helps to remove dirt, dust, manure, and other unwanted materials from the surface and disinfect the wooden, painted, and concrete surfaces in greenhouses and other crop production facilities. On the basis of end use, the agricultural disinfectants market is segmented into livestock farms and agricultural farms. Disinfectants are used by livestock farmers on newborn animals that are highly vulnerable to diseases and infections, due to their immature immune systems. On the basis of form, the agricultural disinfectants market is segmented into liquid, powder, and others (granular and gel). The liquid formulation is projected to grow at the highest CAGR during the forecast period. Liquid agricultural disinfectants are gaining popularity as they are of low cost, less visible on the treated surfaces, and can be applied easily. The Asia-Pacific region is projected to grow at the highest CAGR during the forecast period owing to the increasing demand for animal products in the region. Growth in population, rise in disposable incomes, progressive urbanization in the Asia-Pacific region, and an increase in demand for quality meat products have driven the demand for agricultural disinfectants. Growth is majorly witnessed in China, India, and Japan due to increase in the purchasing power of the population. The major restraints of the agricultural disinfectants market include harmful effects of disinfectants, lack of awareness, and low adoption rate. The agricultural disinfectant market has a number of large- and small-scale firms. New product developments, agreements, and investments are the key strategies adopted by market players to ensure their growth in this market. Players such as The Chemours Company (U.S.), Zoetis (U.S.), Nufarm Limited (U.S.), The Dow Chemical Company (U.S.), and Neogen Corporation (U.S.) collectively accounted for the largest portion of the agricultural disinfectants market till July 2016.